Performing Change was a one-day workshop, with the goal of furthering participant's knowledge in the areas of consumerism and sufficiency and to empower them to make changes in their lives. The event was structured using interactive theatre methods to provide a deeper understanding of the topics and also to foster collaboration with other participants to create a vision for a more sustainable future. Two expert speakers were invited to give a background introduction on consumerism and sufficiency and on sufficiency initiatives and how one can be a part of such activities in Kiel. Visionautik Akademie, a visionary theatre group based out of Berlin, which helps people realize their visions, facilitated the event, using interactive theatre-based exercises throughout the workshop. The consumerism and sufficiency theme was framed around Sustainable Development Goals (SDGs) 12: Responsible Consumption and Production and 13: Climate Action. 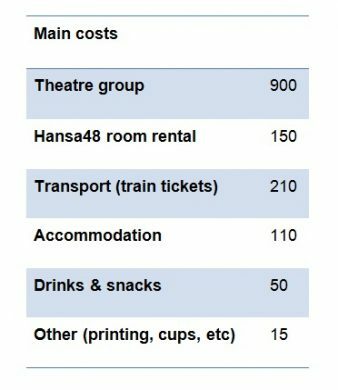 We, the student-run group Social Challenge Encounters, chose Hansa48 as the location for our workshop because we decided that it would be a nice setting and atmosphere for theatre being that they have a stage. Furthermore, we took into consideration its location within the city, the room options we had there and its attractiveness. We first contacted Hansa48 around six weeks before the event, which is advisable for most locations—if we had allowed even more time for it, though, Hansa 48 could have announced our event in their monthly programm. It turned out that Hansa48 was the perfect choice for our workshop, as we could use the stage room and another seminar room, which was ideal for the design of the theatre-based workshop. Not only the location itself was great, but also the cooperation with Hansa48 worked very smoothly—they supported us in the ways that they could and made a lot of things possible for us. We first planned to have four experts inputs and therefore contacted several professors at CAU university, who worked in a sustainability related area, and people from local initiatives who could have told about their personal experience in the field of sufficiency. It took quite some time to finalise our search and therefore the search for speakers should be one of the first things on the to-do list. In the end, we found our speakers through personal contacts. We wanted our snacks to fit the theme of sufficiency and therefore tried to cooperate, like last time, with FoodSharing SH, which did not work out. Instead we got supplies through a Foodsharing potluck from Foodsharing e.V. In addition, we bought the rest of the snacks and tea and coffee at Unverpackt, to save packaging and support a local store. There were a lot of last-minute tasks we had to take care of, such as renting cups from Mensa 1, and getting presentation material from PerLe, to name a couple. Allowing extra time for unforseen tasks and thinking through all small details of carrying out the event is highly advisable. We had a total of 28 participants, 18 of whom filled in the feedback sheet. The greatest number of participants were from the Sustainability program (50%) and the rest were a mix of other students and professions from fields such as geophysics, architecture, IT and community management. Half of the people heard about the event through a friend, 39% through Facebook and 11% through the CAU email. Overall, the average rating of our workshop was 8.4 (out of 10). The rating of the theatre method was 7.5, while the speakers’ input was very popular. Participants’ suggestions for improvements included that the final section of the workshop, the improvisation, could have been shorter (four people). Three people respectively also commented that they would have liked to get a chance to share their own reflections with other participants and be more included overall. 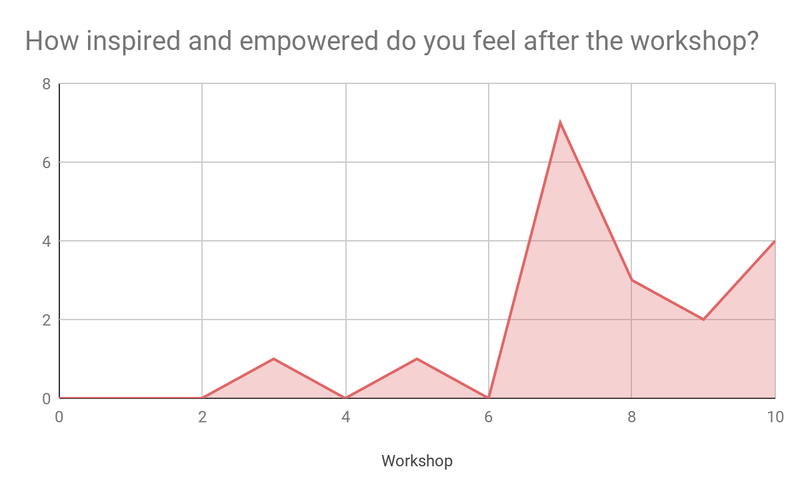 Regardless of several points of criticism 11 people said they were very likely (rating 8, 9 or 10) to recommend further events to their friends and that the workshop made them feel empowered (see graph above). Notes on the buffet: Visionautik Akademie placed small flags with notes into the fruit and food on the tables, encouraging participants to interact with one another. These flags were a creative and fun way to stimulate conversation among participants. 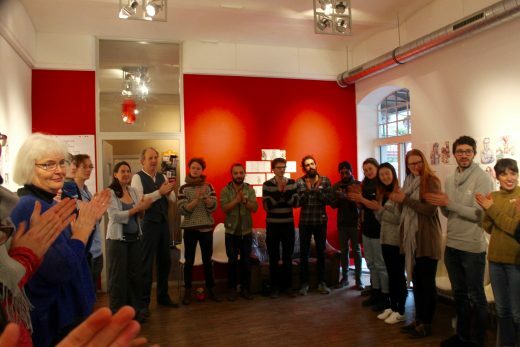 Opening: To help everyone arrive at the event, Jutta led a series of body percussion exercises (energizer method) that required attention to the other group members and brought awareness for the sounds within the room and to the present moment. This collaborative exercise created a sense of solidarity among the group. Sufficiency party: The sufficiency party put together by Jutta and Boris was an excellent way to get participants active and introduced to one another. When music was played, participants danced around the room, and when it stopped participants paired up with their nearest neighbor and spoke about a question prompted by Jutta. In hindsight, it would have been nice to have a short reflection about how we can enjoy our time without consuming as we were doing during the sufficiency party before transitioning to the next activity. Cooperation with Foodsharing e.V. : Our team member Henriette was able to collect a diverse range food and beverages from a Foodsharing e.V. event at Alte Mu the day before our event. We labelled the foods that were rescued by Foodsharing and placed their flyers on the table for participants to learn more about the organization. Atmosphere: We believe that we did a good job making people feel welcomed upon arrival by greeting them personally. The location was warmly decorated with colorful walls and artwork. The snack table set up made for a colorful and abundant assortment of rescued and sustainably purchased food. The warming-up methods further encouraged mingling and getting to know each other. Preparation: Some participants noted wanting to have been provided with reading material before the event. Taking this into consideration, we think that at least including stufficiency related questions, definitions or prompts on our Facebook page would have given people a better idea of what the workshop would be about and prepared them for it. Moreover, we could have provided a couple of short pieces of literature for those who might have been interested. Sufficiency pamphlet: It would have been nice to have had a little sheet or pamphlet listing local sufficiency or sustainable-consumption initiatives in Kiel that participants could get involved with as well as tips for living a happy life with less material possessions. We feel that many people left feeling a little empty-handed and had expected to leave feeling empowered and with a better idea of what they could change in their lives regarding sufficiency. Participant Input: More time for participant input, exchange of personal good practice, discussion in the group activities and the theatre performances would have made for a more reflective event overall. 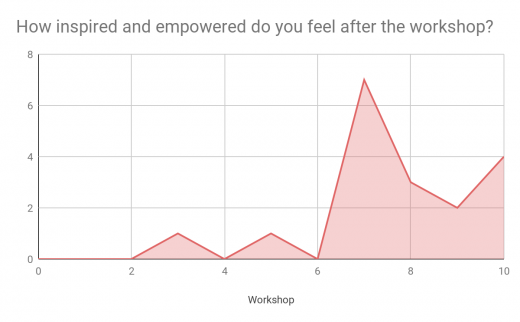 According to the feedback, many participants felt that this was missing, and hence, led to a low rate of inspiration or empowerment among participants. Local Initiatives: It would have been nice to have had representatives from local sufficiency-related initiatives at the event so that participants could have learned more about their efforts and how they can get involved. Detailed outline: We believe that the event would have been more successful overall had we provided a more detailed outline of an event concept for Jutta and Boris. Being that they are experienced professionals, we placed more of the weight of organizing the event in their hands than what we believe we should have. If we were to hold the event again, we would have put together a structured outline, asking them to fulfill theatrical training tasks. Because we did not make our vision clear from the beginning, the event ended up with less theatrical participation and involvement from the participants than we anticipated. To prevent this, we could have arranged a (Skype) meeting beforehand to talk about our ideas and their plans in detail to align expectations and visions for the workshop. 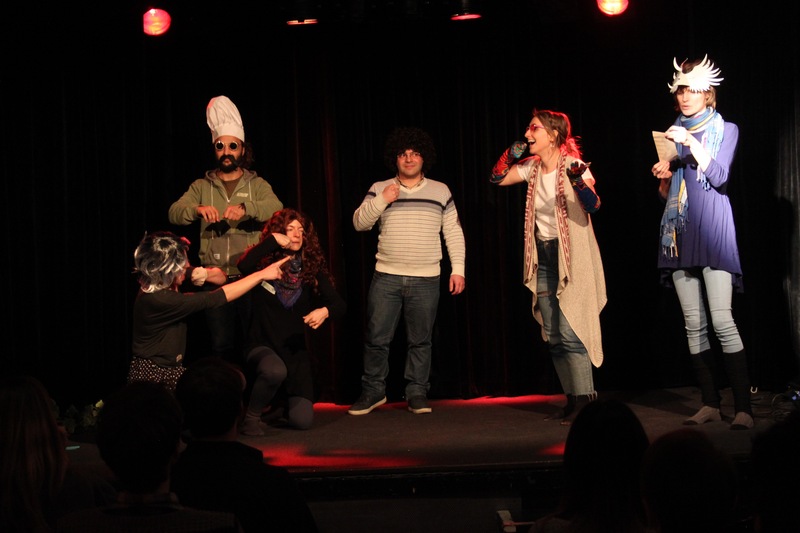 Wrap Up: The event was lacking a send-off and ended rather abruptly. Backup Plan: In hindsight, it would have been best to have a back-up plan for unanticipated circumstances. Such a plan could have provided a framework for us to make an impromptu ending, for example. Total costs for the event came to just over 1500 euros. 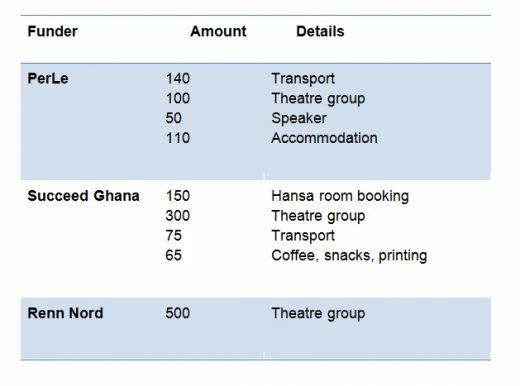 The main costs are broken down in the table below, and the last table shows how we split up these costs between the three funding sources we had for the event—PerLe, Succeed in Ghana and Renn Nord.